This morning, when I drove from Pudong to Puxi on the Nanpu Bridge, I saw there is no car on the opposite of the Nanpu Bridge. This is very strange, since in rush hours, it is unbelievable there is no single car there, for that long. When when I approach the Puxi side, I found policeman were there, and there are policemen to block the cars from all directions. In short, the Nanpu Bridge was closed for a short period of time this morning. 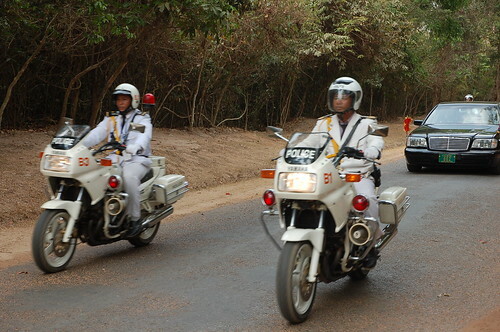 It is very common that for some “very important person”, police close a road or many to let them go. It is rare though for the whole bridge to be closed. I don’t know what happened, who are coming, and who the “VIP” is. The policemen are using public resources, but without limitation of its power, currently, it seems it is their own resources. That is a problem. This reminds me of my trip to Cambodia. From time to time – many times a day – our tour bus was stopped and pushed aside just for the VIPs to pass. This was very typical in China 10 years ago. Recently years, China has changed to be better. At least in terms of police guarded cars, China is better than Cambodia. We are often stopped, but not daily at least. However, there is still a long way to go – when the time will come when those VIP feel a little bit embarrassed to close the whole bridge in rush hours for several minutes they can save. what can we say about such thing in china? to me, closing a bridge during rush hour is a lot less of a sin then the other stuff you can read about regarding chinese government injustices in Shanghai and further afield….anyone read about chen liangyu and his cronies’ misdeeds? The government has its way no matter what people think. the pace of development in places like Shanghai would only be retarded if democracy took over. This happens in the USA as well. When there was a foreign VIP coming in to visit a historic site around where I live, they took all four lanes and all cars waited aside for a minute. in Paris France ,we have VIP too ! !and all days ! !and many times a day !! You are right, that’s why we are seeing the environmental degradation, corruption and its related effects because of this pace of development. Let’s hope China doesn’t destroy itself before it meets its development goals. I don’t think it is correct or acceptable, just because it is also happened in USA. I agree with jianshuo about “the police use the public resources, and use them without limitation on their power. These “VIP” should feel some embarrassment with this situation. I don’t think it is correct or acceptable, just since it is also happened in USA. I agree with jianshuo that the police use the public resources, and without limits on their power. The “VIP” should feel embarrassment with this situation. Please type the following phrase to confirm you are a human: I, for one, welcom+e our new overlords.